Cons: This wide out is already 22-years old and maxed out physically. He missed two games this past season to an ankle injury, but recovered fully. His 92 catch, 1249 receiving yards, and eleven touchdown season was more of a product having two freshmen receivers on the field with him than a declaration of his talent. Hansen is more quick than fast, didn’t catch many passes in the middle of the field, and usually went down when a defender got a hold of him instead of breaking the tackle. The receiver must do a better job shielding the pigskin from defenders and winning more of his 50/50 targets. Pros: He spends most of his time split out wide or sent in motion, but can use his hands and feet to create some separation off the line of scrimmage. Hansen ran a lot of comebacks, screens, and nine routes, but might be able to do more if asked. The receiver does a good job catching the ball in stride with out-stretched arms. The former Golden Bear tracks the ball well in the air, can contort himself to snare the pigskin at both its highest or lowest points which creates a big catch radius. He has tremendous field and yardage awareness, knowing where he needs to get to for the first down. The wide out is quite dangerous in the open field, using start/stops, double moves, and uses his short area burst to get away. Hansen can ball near the end zone and has perfected a nice bucket catch in front of the cone. 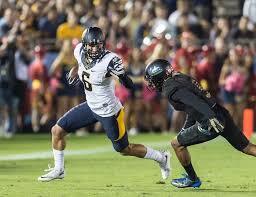 Overall impressions: Hansen is a steady receiver, who relies on his quickness. His fantasy draft stock will rise or fall with which team drafts him. He might be the next Chris Hogan a.k.a. a role player in one organization or an important cog for someone else. The wide out is a late bloomer, so don’t be surprised if he stays on someone’s practice squad or only plays in three and four wide sets at the beginning of his NFL career. Thanks for reading. I will continue to discuss my scouting reports with you throughout the next week or so, please keep checking the site for more content. You can also follow me on Twitter @AndrewMiley.